Join the Gettysburg Foundation’s Sue Boardman, Licensed Battlefield Guide and author/historian, on the platform at 6 p.m. for an exciting and exclusive “after-hours” program of the Gettysburg Cyclorama painting at the Gettysburg National Military Park Museum and Visitor Center, located at 1195 Baltimore Pike. 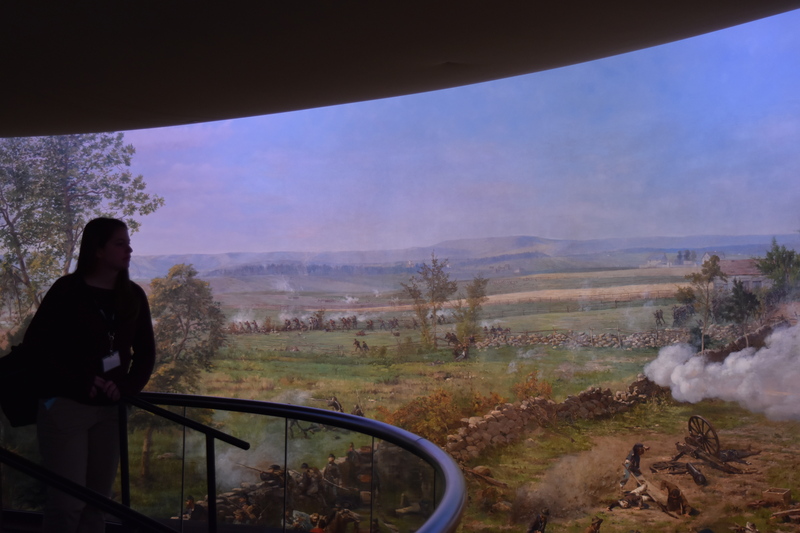 Visitors will have a chance to spend “quality time” for an up-close and personal look at our country’s colossal painting, the Gettysburg Cyclorama. Visitors will explore the history of the genre of cycloramas and in particular the history of the Battle of Gettysburg Cyclorama. The presentation will include a discussion of the massive multi-year conservation effort of our country’s largest painting. The program concludes with extended time on the platform to view the painting in full light and a journey under the diorama to see how the masterful illusion comes to life. The program begins in the Ford Motor Company Fund Education Center at the Gettysburg National Military Park Museum and Visitor Center. Flash photography is welcomed and encouraged! Visit gettysburgfoundation.org or call 877-874-2478 for tickets.